After the disappointment of Hanoi, what direction will Kim take? For the first time in the country’s history, North Korea’s parliamentary election for the Supreme People’s Assembly (SPA), held on March 10, did not see the Supreme Leader “elected” to the SPA. This suggests that constitutional amendments concerning state organs, including the position of Kim Jong-un, will be made at the first session of the 14th SPA on April 11. There is a possibility that North Korea’s own unique version of a presidential system will be introduced. At the outset, this change was presumably a step taken in anticipation of Kim Jong-un bringing home “results” from the 2019 North Korea–United States Hanoi Summit. The direction of North Korea’s strategy towards the United States will, therefore, quite likely become apparent around about the time the SPA is convened. Restraint towards the United States was mentioned only once at the end of a generally upbeat speech and the original Korean text repeatedly used the wording “we may be compelled,” or “we may have no choice but.” While it was considered unlikely that North Korea would embark on a “new way” for the reason given in the speech alone, now that North Korea has failed to gain any concessions at the recent summit, the risk of North Korea finding a “new way” also needs to be monitored. Kim Jong-un is unlike his predecessors in that he does not try to gloss over failure. A review of the course of events to date affords a glimpse of a man who tries to overcome previous misses. For example, in April 2012, not long after Kim Jong-un assumed power, North Korea failed in its attempt to put a satellite into orbit, and its official news agency reported immediately afterward that “The earth observation satellite failed to enter its preset orbit. Scientists, technicians and experts are now looking into the cause of the failure.” Once, North Korea would have reported the launch as a huge success even if it had failed. Similarly, at the SPA, since 2014, Kim Jong-un has not allowed his subordinates to simply flaunt economic “successes” but has instructed them to admit “failure” and explain ways to overcome them. Kim Jong-un is said to have been a dedicated basketball player in his youth and if his team lost a match, he always held an evaluation meeting and worked out a strategy to win the next one. His personality trait of learning from and overcoming past mistakes is a ray of light amid the vagaries of the North Korea situation. 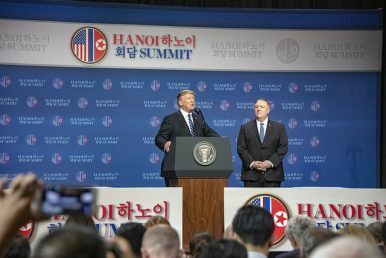 There was also the time when, just before the first DPRK-U.S. summit, the summit was in danger of not going ahead, after North Korea issued a statement criticizing U.S. Vice President Mike Pence as a “political dummy.” North Korea saw this as tough tactics before the summit; however, Trump published a letter to Kim Jong-un notifying him that he was cancelling the summit immediately. North Korea then rushed to put out the fire by issuing a “very nice” statement within 10 hours of Trump’s letter. This was an unusual response, given the conventional image of North Korea’s insistence on maintaining face. There is no doubt that, for Kim Jong-un, the outcome of the second DPRK-U.S. summit was extremely disappointing. Washington’s demands expanded to include biological weapons, and the hurdles to an accord became even higher. Yet it is possible that Kim Jong-un will begin to consider a realistic rollback policy and opt for economic gain over keeping face. Though the situation is unpredictable, if we consider the recent breakdown of talks over a somewhat longer term perspective, it might just be seen as one step along the path to achieving a true breakthrough. It was also stressed at Trump’s press conference that negotiations would continue, and the United States subsequently announced the cancellation of annual large–scale joint exercises conducted with the South Korean military in spring. The crux of the matter will be to what extent Trump can maintain a stance of continuing dialogue with North Korea while not moving the goal posts of “complete denuclearization” and also giving due consideration to not undermining the authority of Kim Jong-un. Atsuhito Isozaki is an associate professor at Keio University.